The tale comes to life on Zemog’s self-titled, debut recording. On stage, the band crows like roosters. One player dons a rooster costume. “In the spirit of Sun Ra,” explains Gomez. Rumba Pa’la Niñas is Gomez’ favorite song on the record. 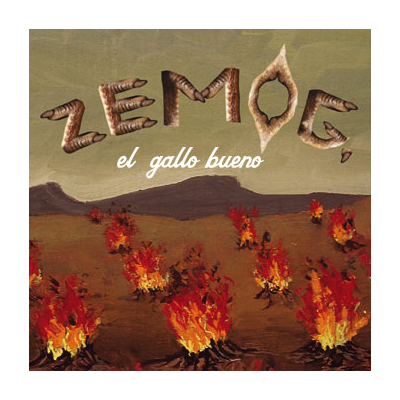 The sound of Zemog, El Gallo Bueno—which is “Gomez” spelled backwards followed by “The Good Rooster” in Spanish—starts with Gomez’s quirky tastes. “I really love roots music from Puerto Rico. Like mountain music and field recordings,” says Gomez. “It’s so raw… it’s like rock and roll. Crazy nasally screaming.” The band’s repertoire is a direct result of Gomez’ bicultural experience, his musical past, and the rest of the band members’ expertise. Crucial to Gomez’s musical development was his earlier band, Jayuya, which had similar influences, but was a four-piece rock/salsa band. Zemog’s instrumentation is that of a nine-piece salsa band, but lyrically stays close to the rock-n-roll stream of consciousness approach. Abraham Gomez-Delgado is a composer, multi-instrumentalist and performance artist born in Rio Piedras, Puerto Rico. Bandleader Abraham Gomez-Delgado, of Peruvian descent, left his native Puerto Rico as a child and relocated to the US. He leads the experimental Latin music group Zemog el Gallo Bueno as well as co-leads the avant-latin jazz big band Positive Catastrophe and has a Performance Art group under the name Eje. Gomez-Delgado is also a vocalist in his own compositions as well as in composer saxophonist Fred Ho’s Green Monster Big Band. Currently he teaches Sound Art and production at Bloomfield College in New Jersey and is composing a Plena suite entitled Debrujo, Debrooho, debrewjo. Recently he was awarded the New Jazz Works grant from Chamber Music America and the Doris Duke Foundation (2010). Abraham has been awarded a Meet The Composer MetLife Grant (2010) and the USArtists International Award, National Endowment for the Arts grant (2010). Gomez-Delgado has his MFA with honors from Bard College and holds a BFA from Mass College of Art.